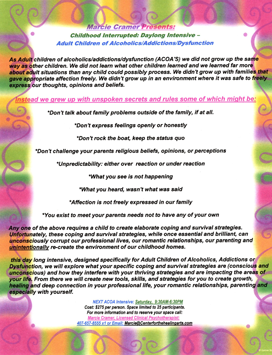 If you grew up with an alcoholic parent or caretaker, or suspect that your childhood environment was affected by addiction, we can help you to understand and to heal. is dedicated to helping our clients heal, find balance, and treatment through the use of neurofeedback, biofeedback and life coaching. is one of the first dedicated group practices devoted to challenging, supportive, and nurturing psychotherapy. Therapists who listen and care. Our areas of expertise for individual, group, marriage & family psychotherapy are diverse. Read more about the modes of psychotherapy offered. is a dual purpose nonprofit to provide Service Dogs, through rescue, to individuals with invisible disabilities (psychological, emotional or intellectual). All published fees for workshops include our 5% discount for cash or checks. You are more than welcome to use a credit card but then the 5% discount goes away and the cost will revert to the non- discounted amount (which is 5% higher). 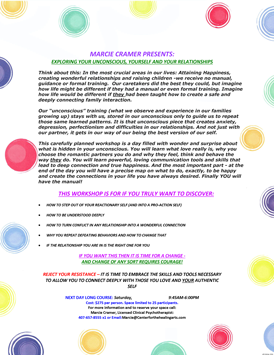 To dispel the myth that we should simply know, without any formal training, how to have healthy relationships, how to parent, and how to be happy. To eradicate the thinking that getting educated in these areas means we are mentally ill, defective, sick, or weak. To provide the most critical education of our lives: how to achieve our need for love, happiness, and a fulfilling life.